The flowerhorn is one of the easiest aquarium fishes to keep. These hybrid cichlids are very hardy and can thrive even on bad water parameters. With a little care and time to spare, enhancing flowerhorn head growth is not that hard as well. 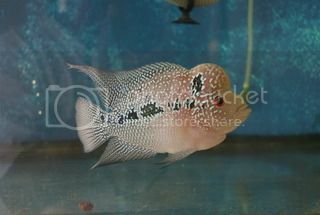 Flowerhorn breeding is also one of the exciting activities many hobbyists engage into. Some even would cross breed different types of flowerhorns to produce new and exciting ones. If you are a first time louhan owner, it is usually not advised to purchase high quality louhan especially with fully-developed head/kok as they could cost a lot. There are a lot of louhan sale that could be easily checked out in the internet. If you are lucky, a local pet shop may also have a sale louhan on stock. However, the easiest way to find a good sale is through browsing the different forums. There are a lot of local and international forums that have put dedicated venues for selling and buying cichlids. The safest way is to buy from a local seller you found online or have been referred to you by someone you know. A seller you can visit on a weekend to check his stock. Keeping a warm conversation with a local seller, who is likely an avid louhan hobbyist himself, is going to earn you some bonus. Remember that different parts of the world have different climates, types of water, etc that may affect your pet. Local hobbyists usually know the best practices in your area, so their insights are really indispensable. By purchasing a louhan on sale, you will be able to save some cash that you can use to buy a larger tank or a better filtration system. The usual mistake of first time keepers is to skimp on tank size. The minimum volume for flowerhorn fish tank should 50 gallons. Having an effective filtration system is also very critical in keeping your cichlids healthy and beautiful. Avid cichlid hobbyists have become so because keeping these beautiful fishes does not seem to equate with how easy they are to keep. These hardy cichlids can survive quite extreme water conditions. They are also omnivorous making them very easy to care for. In fact, in just a matter of a few months, many hobbyists would start to consider breeding after they felt they have already mastered louhan keeping. Being able to produce your own fry is really exhilarating. It is even more rewarding when you find out that your fry have grown to become high quality ones. Joining competitions is another great way to enjoy these amazing cichlids. In joining contests, it is not hard to find new friends and acquaintances in the hobby. It is also a great way to exchange and learn new ideas on just about anything on louhans. They may even tell you their secrets of bringing out the head/kok of their flowerhorns. It is also a great opportunity of buying high quality specimens on sale. And if you get a little luckier, you might even score a new louhan for free.